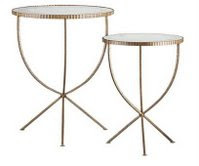 I think these would look perfect flanking a lucite or glass bar table! Perfect for a pop of color atop the table in a breakfast nook! Fabulous for those lazy breakfast in bed days with the laptop. with a mirror or two. These would look great bunched together or flanking a couch or settee. I love the depth of this demilune table...the fact that you can't see behind or under it is a plus in a lot of ways; I would probably consider using it behind a loveseat or as a small console table. Anywho, I was searching the C&B website today (yesterday), and came across some lovely items that I just had to share. They are a combination of modern and traditional items. I adore the jules tables, but am not very fond of the patina antiqued look atop, but I'm sure it would work well for some.